Playground Rubber Interlocking Tiles 2' x 2' x 2-1/2" are great for outdoor play area surfaces. Minimum order of 150 tiles are required by manufacturer and ship freight truck. Finish edging and ramps are available - contact us for a quote on your project. Alessco Playground tiles may be installed over a solid sub-surface such as concrete or asphalt, or over a compacted granular sub-base. In all cases, proper drainage must be provided due to the porous nature of the tiles. This can be achieved by either a well-defined gradient of the surface or well-placed drainage pipe in lower spots. 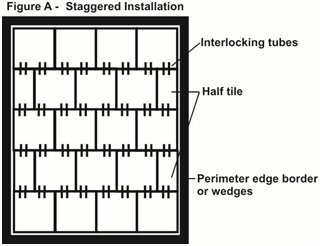 For interior applications, adequate floor drains must be in place prior to the installation of the tiles.